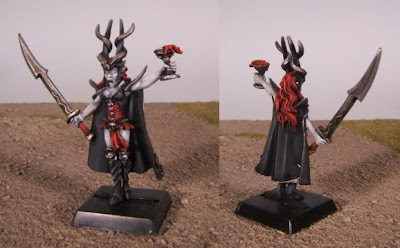 I painted a dark elf hag for a friend's birthday present. Click to enlarge, as usual. I've had the figure for ages and bought it through the GW mail order "bitz" deal when that option was available. Although I'm certain I didn't get the color right, the dominant colors in his army are red & black. I originally did the hair in a more natural color but it didn't seem to fit the simple color scheme. I think this has a bit more punch. I think one light wash on the eyeballs to bring out the joint where they meet the eyelids would have helped a bit. The base was left unfinished so he could match his army himself. 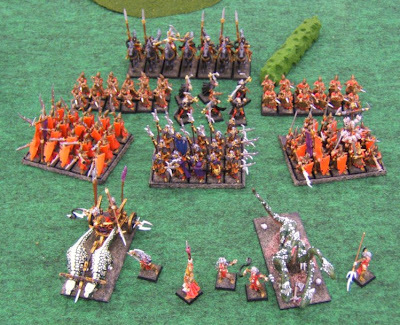 Here's a pic I took of his army at Marauders (Audumn) '08.